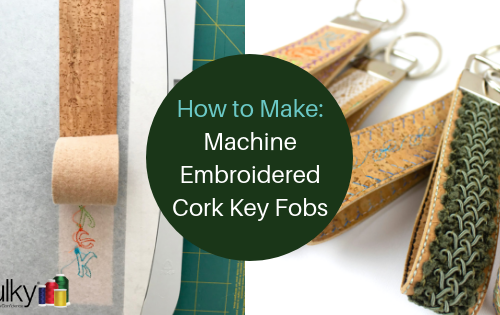 Several years ago, when first asked to present a machine embroidered paper project, my initial thought was…. “why?” Why invest time, not to mention the cost of materials, into a “disposable project”? Seriously? 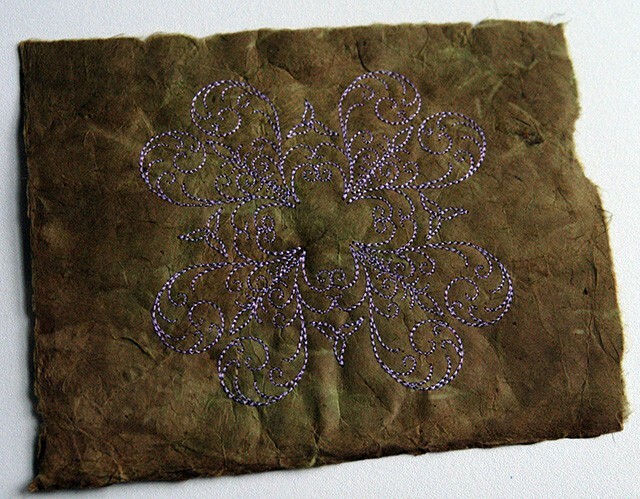 However, once the experimentation began, it was then I realized that paper is not only a fun foundation for machine embroidery, but it presents many wonderful possibilities, which I guarantee will never be thrown away! 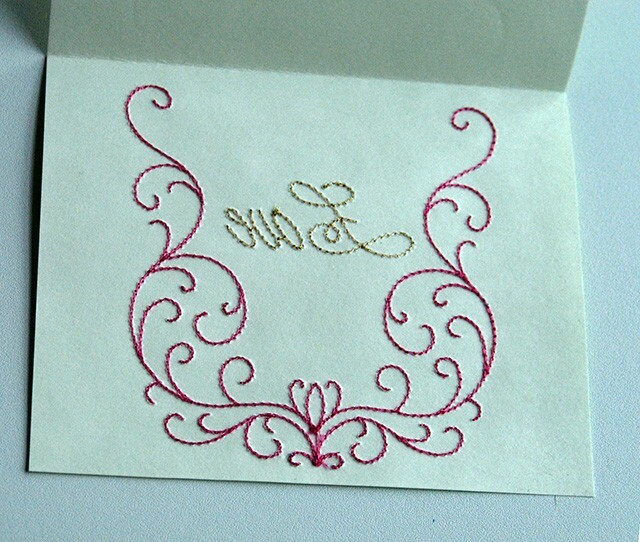 Some embroidered items, such as a card, may be treasured for the time taken to honor a special occasion. 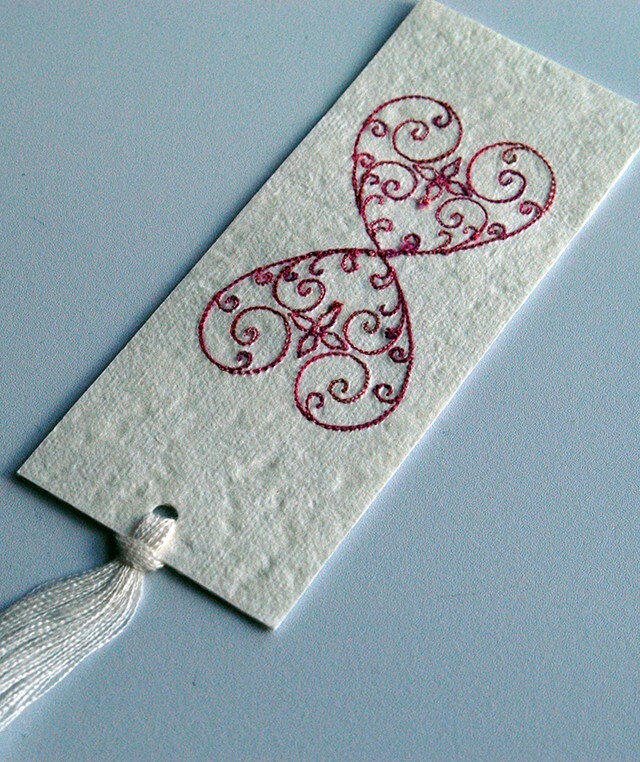 Other embroidered paper items will be recycled from the original intent, like a Christmas gift tag, into a tree ornament, gracing tree limbs for many years to come. Other gifts, such as a bookmark, will be appreciated daily. It is amazing how many wonderfully, unique paper products are available and most are compatible with machine embroidery! Hand-made papers provide a small advantage over manufactured ones in that they use the longer fibers from type-specific plants when processed into paper which often yield interesting designs or add textures into the overall appearance. 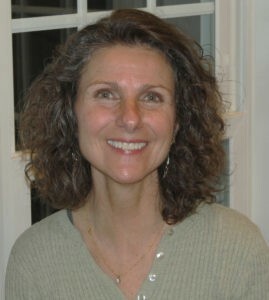 More importantly, the longer fibers mimic “fabric-like properties”. 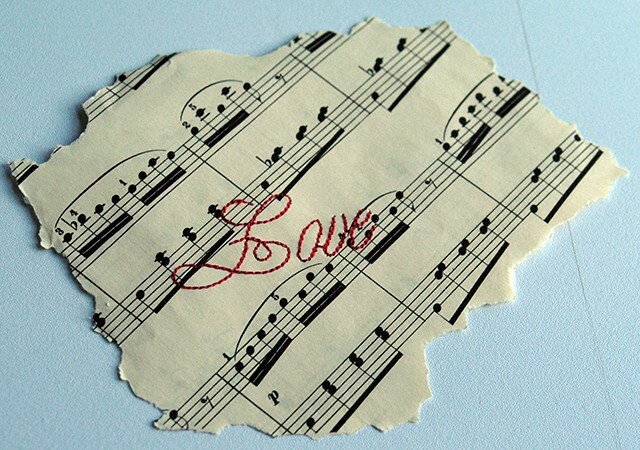 One might think that the paper foundation is the restrictive factor in successful machine embroidering, but thanks to the many choices found within the Sulky® stabilizer family, the type of paper almost becomes irrelevant as witnessed by this embroidered piece of sheet music; later used in making a Valentine! 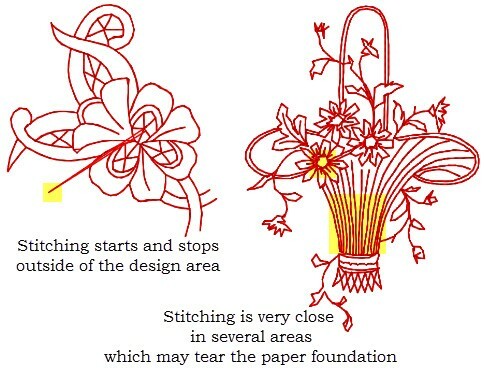 The key factor for successfully embroidering on paper is the design. Professional digitizers understand the properties of paper and many offer collections specifically for this type of project. Paper is a non-forgiving surface; meaning, once a hole is made, it is there forever. Not only must every stitch matter by being part of the actual design, needle punctures cannot be too close together or the paper will tear. Redwork, stippling and line designs may prove to be a good choice, providing you understand the design’s stitching process. You will need to skip over any jump stitches outside the outline and avoid line designs which include closely placed stitches. 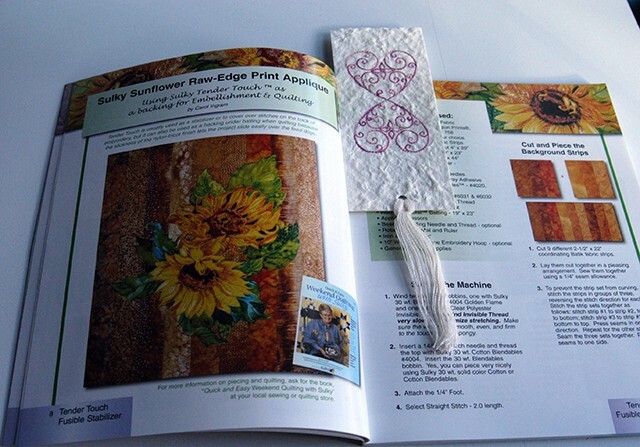 Sulky® Sticky+™ is the natural choice for paper embroidery. Obviously, paper cannot be secured directly in the hoop. 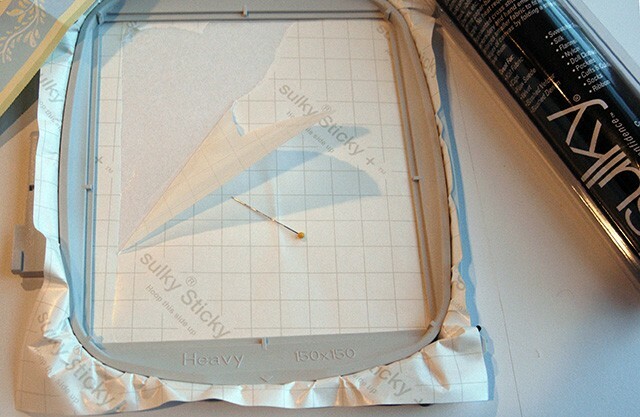 Securing Sticky+ in the hoop allows decorative paper to be stabilized by firmly pressing it to the exposed sticky surface. 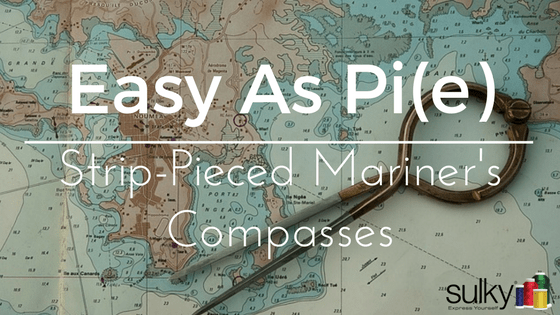 If a design needs to be stitched in a specific location on the specialty paper, mark a small piece of painter’s tape and gently press it in place. 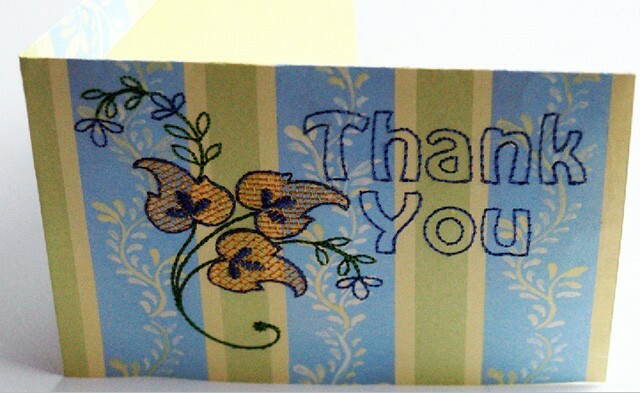 For this card, the lower right quarter of a large piece of scrapbook paper was centered in the hoop and pressed to Sticky+. 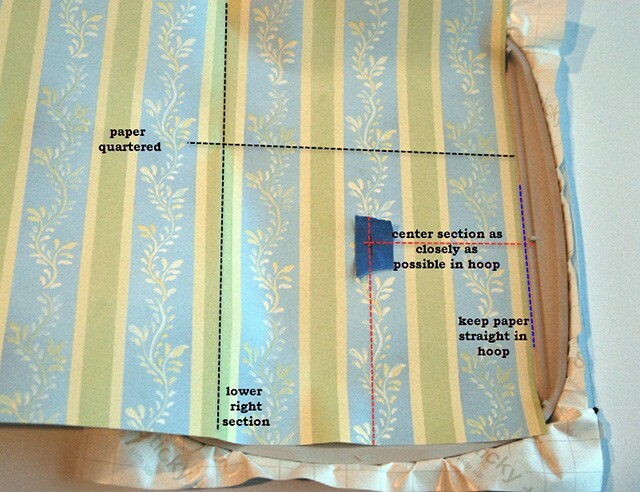 Since this paper has a prominent linear pattern, it is important to keep the paper straight in the hoop. the blue tape was removed and the embroidery began. 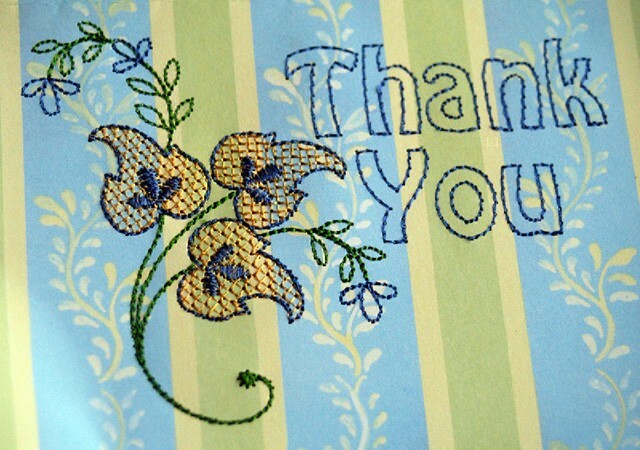 The design, from My Fair Lady’s Summer Stipple Collection, available here, was stitched in 40 wt. Sulky Rayon Thread with a 75/11 embroidery needle. The speed of the embroidery machine was slowed by half and the entire stitching process monitored. 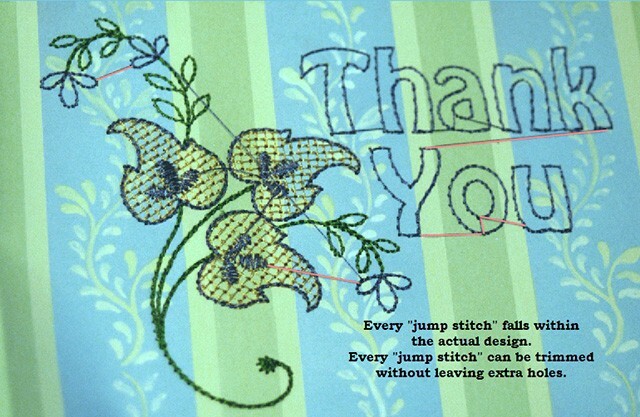 Although there are jump stitches, all are acceptable because every stitch becomes a part of the true design. 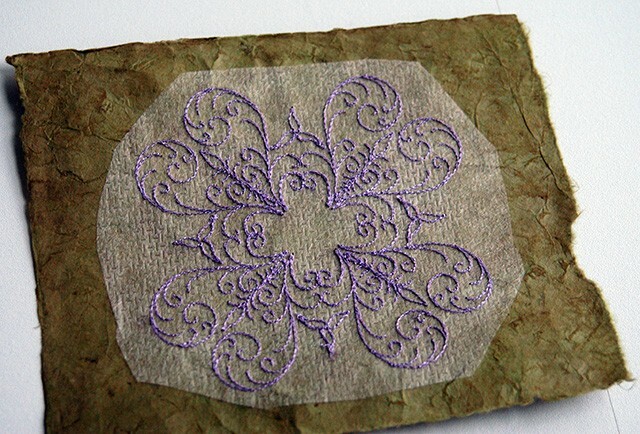 Once all the jump stitches have been cut, the design displays as a clean, definitive picture with no extra holes left in any part of the paper. but it will bond with textured paper. 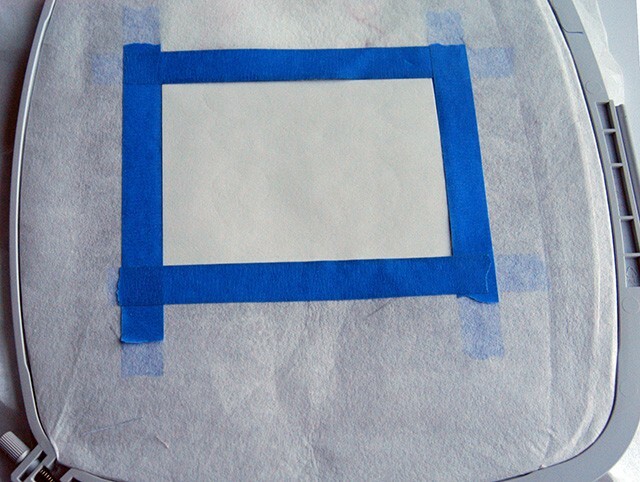 Even on coated paper, removing the stabilizer in closely stitched areas proves to be difficult. 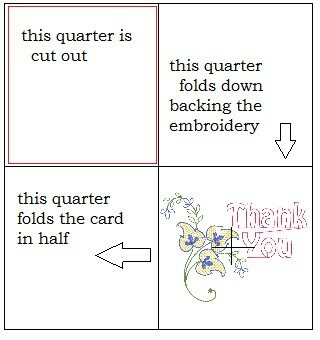 Choose this stabilizer only if the wrong side of the embroidery is not a factor. 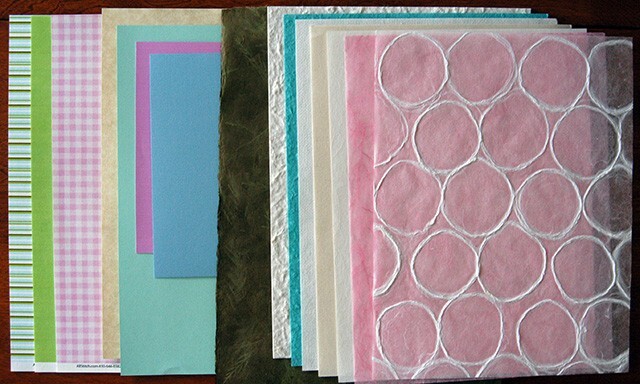 Some light-weight papers might withstand wear and tear better, if backed with a thin “fabric”. Hoop Sulky Soft ’n Sheer™, a strong, light-weight, fabric-like stabilizer. 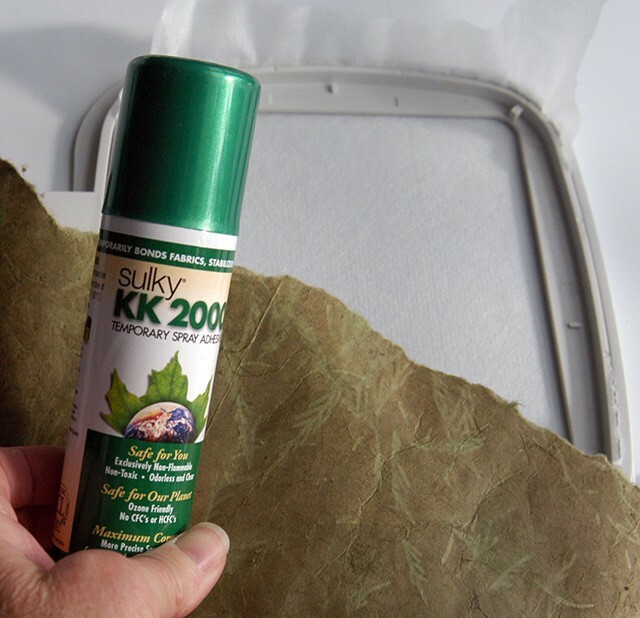 Spray the back of the paper with KK 2000™ Temporary Spray Adhesive and press the paper firmly to the stabilizer. Once embroidery is complete, excess stabilizer can be gently lifted and cut from the design’s perimeter. The remaining stabilizer will offer continual support without affecting the feel or thickness of the paper. Lokta paper is handmade in Nepal. It is strong and durable, yet has a soft, almost fabric-like feel. 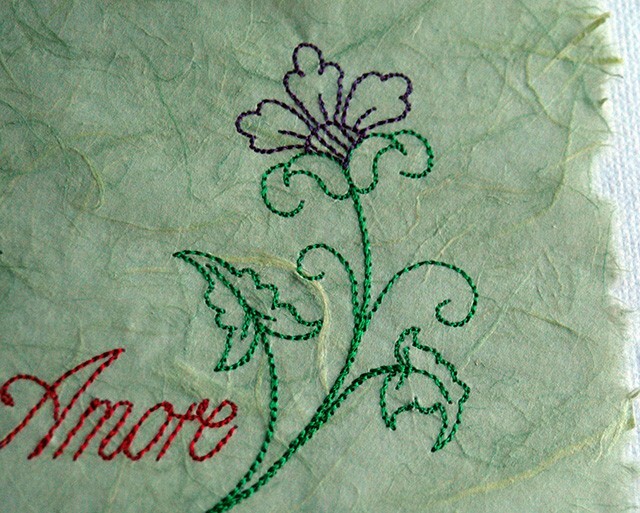 It willingly accepts machine embroidery as witnessed with a Valentine’s Stipple design from My Fair Lady. If the right type of paper is correctly matched to a properly digitized design, there is no need for additional foundational support. Well, except for the fact that the project needs the means to travel through the computerized path of the embroidery process…translating into…a hooped stabilizer! 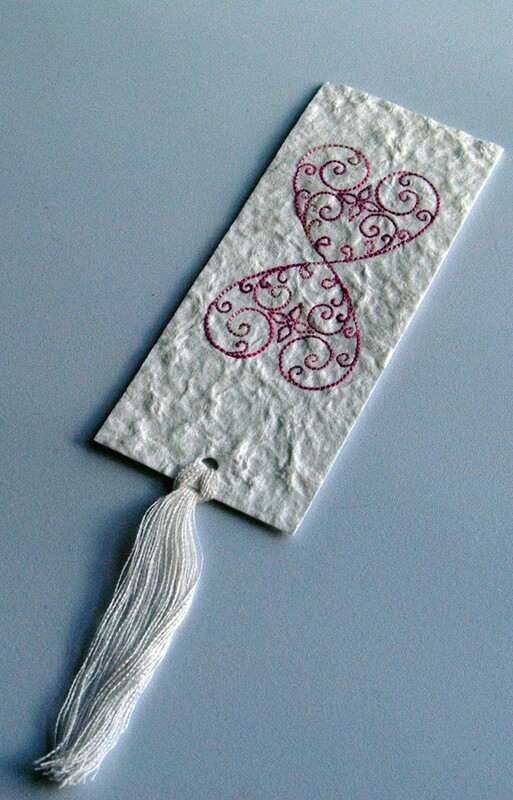 This bookmark is stitched on a textured, heavyweight Mulberry paper with a Sulky 12 wt. 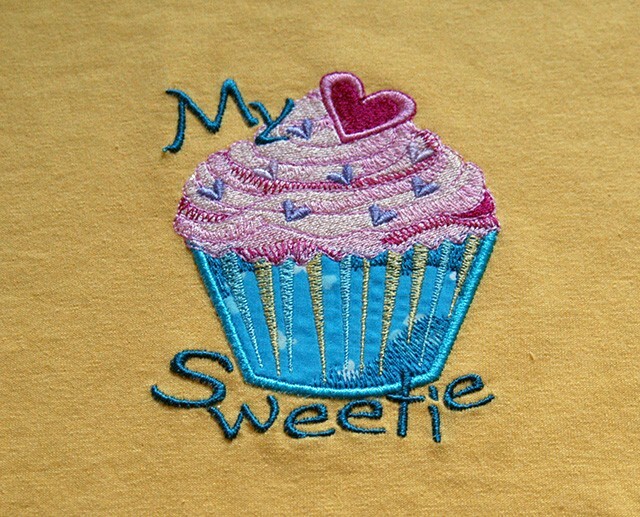 Cotton Blendables® Thread, using a 100/16 Topstitch Needle and slowing the embroidery machine down to its slowest speed. Notice that the wrong side does not show any stabilizer; not even a hint of residual! a firm, medium-weight, tear-away stabilizer in a large hoop (260 x 200mm). Cut a generic size window in the center of the hoop (5” square). Reinforce the cut on both sides with painter’s tape. 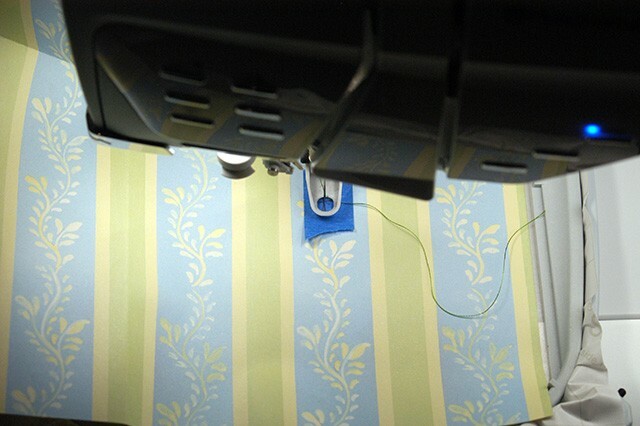 making sure that the embroidered area falls within the open, cut-out window. 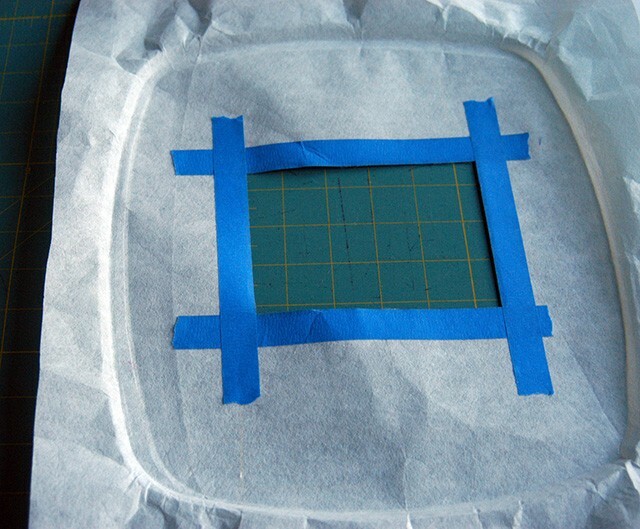 Prior to taping, the window can be re-cut to accommodate a larger design if need be. Stitch the design using the same thread in top and bobbin, since the back needs to mirror image the front. 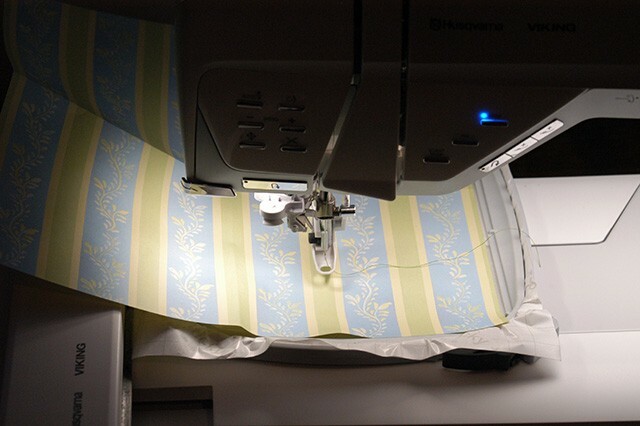 Remove the holding tape, releasing the embroidered paper from the stabilizer. Save this stabilizer template as it can be re-used many times. My Fair Lady’s design is stitched on Quick Stitch paper, characterized by being resistant to water and tearing and is available in a wide variety of bright colors and patterns. The scrolling design is stitched in Sulky 40 wt, Rayon Thread. 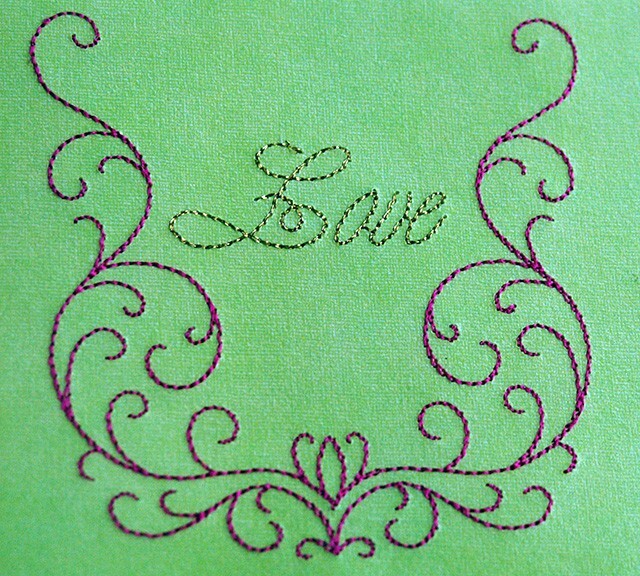 Sulky Original Metallic Thread was used to stitch the word “Love”. By slowing the machine down to its slowest speed, a Microtex Sharp 70/10 needle could be used ensuring small penetration marks for this running/straight stitch design. The back side of the design is as clean looking as the front. Using the same hooping technique, a textured light-weight Mulberry Paper was taped to the stabilizer template. 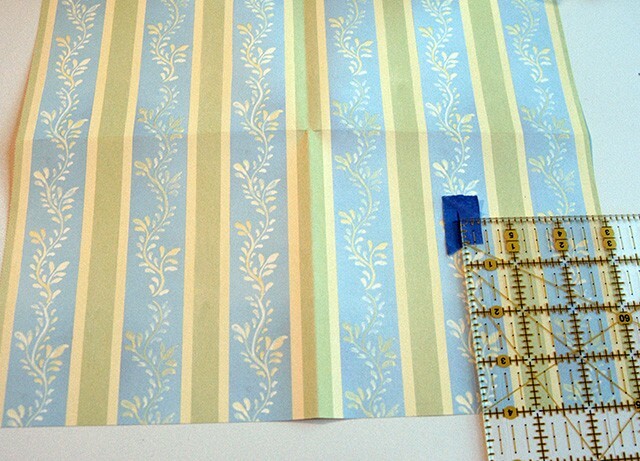 A piece of Washi paper, characterized as a strong, but translucent, tissue-weight paper, was lightly sprayed with KK 2000 Temporary Spray Adhesive and firmly pressed on top of the Mulberry paper. 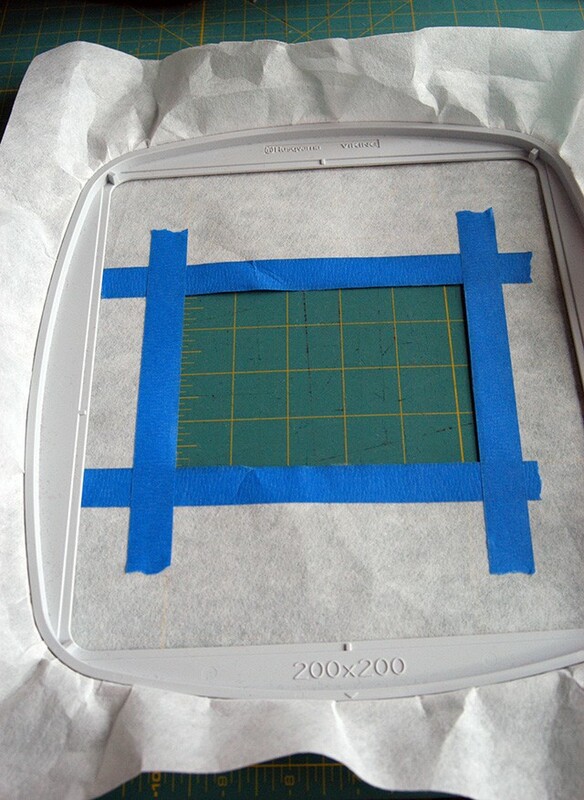 Once again, the stabilizer was only needed to provide the stitching process because the Mulberry paper became the supportive foundation for the fragile Washi paper. Stitching was done with a 75/11 Embroidery Needle in Sulky 40 wt. Rayon Thread. Machine embroidering on paper brings creativity to the front burner!!! Truly a material that initially one might dismiss as “disposable”, deserves to be reconsidered! 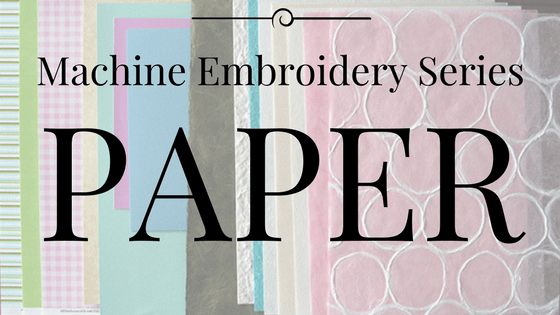 Many types of paper, but especially handmade paper, not only enhances a machine embroidered design, but can also be incorporated into a project which endures time and will possibly be handed down to the next generation. Amazingly beautiful, and durable paper that welcomes machine embroidery is available!!! Find it! Experiment with it! Use your imagination to create truly unique gifts!! Credits: A wonderful resource for unique papers, to include a much wider variety than featured in this article, is available at: www.mulberrypaperandmore.com. 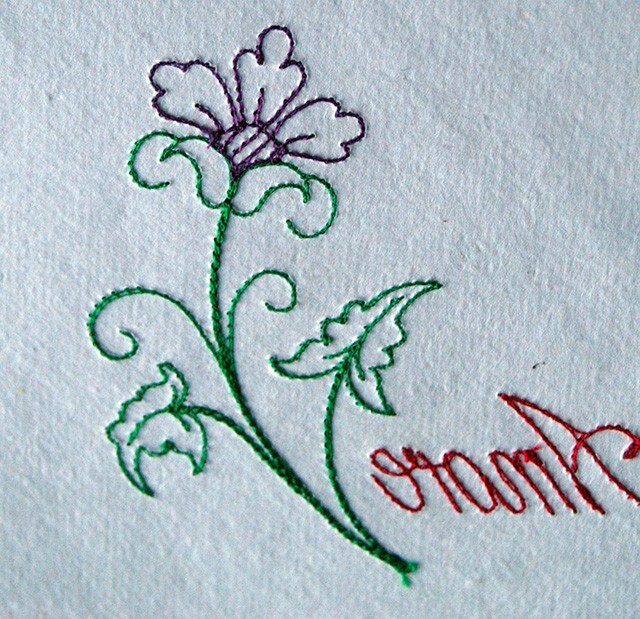 Quick Stitch embroidery paper available at www.allstitch.net. 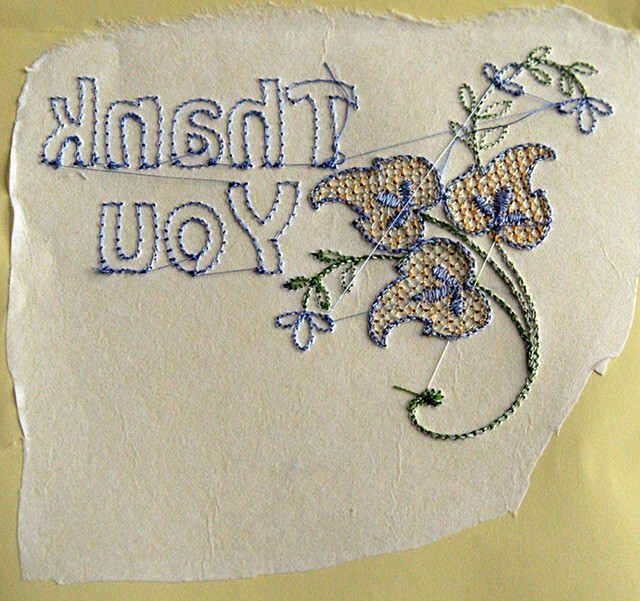 All embroidery designs featured are from various stipple collections digitized by “My Fair Lady” available at www.myfairladydesigns.com. That is awesome!!! I will be trying this VERY soon.